PT-FX400U: 3-LCD, 1024x768 resolution, 4000 Lumens, 600:1 contrast ratio, H & V lens shift, Wired Networking, DVI-I & HDMI inputs. PT-D6000US: 1024x768 Resolution, 6,500 Lumens, 2,000:1 Contrast Ratio, H & V lens shift, RGB booster, detail clarity processor, dual lamp, system daylight view 2, auto cleaning filter, liquid cooling system. PT-D6000ULK: 1024x768 Resolution, 6,500 Lumens, 2,000:1 Contrast Ratio, H & V lens shift, RGB booster, detail clarity processor, dual lamp, system daylight view 2, auto cleaning filter, liquid cooling system. See optional lenses. PT-DX500U: 1-Chip DLP, 1024x768 resolution, 4500 Lumens, 2000:1 contrast ratio, H & V lens shift, Wired Networking, DICOM Simulation Mode for viewing X-Ray images, RGBHV, DVI-D w/HDCP & HDMI inputs. PT-FX500U: 3-LCD, 1024x768 Resolution, 5000 Lumens, 10,000:1 Contrast Ratio, H & V Lens Shift, Wired Networking, HDMI, DICOM Simulation Mode, Corner Keystone & Curved Screen Correction. PT-EX510U: 3-LCD, 1024x768 resolution, 5300 Lumens, 2000:1 contrast ratio, H & V lens shift, Wired Networking, Side-by-Side and P-in-P Modes, DICOM Simulation Mode, 4500-Hr Lamp, RGBHV, DVI-D w/HDCP, and HDMI inputs. See optional lenses. PT-EX610UL: 3-LCD, 1024x768 resolution, 6200 Lumens, 5000:1 contrast ratio, H & V lens shift, Wired Networking, Side-by-Side and P-in-P Modes, DICOM Simulation Mode, 4500-Hr Lamp, RGBHV, DVI-D w/HDCP, HDMI, and DisplayPort inputs. Order lens separately - no lens included. See optional lenses. 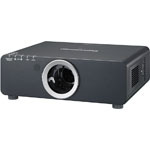 PT-EX620LU: 3-LCD, 1024x768 resolution, 6200 Lumens, 10,000:1 contrast ratio, H & V lens shift, Wired Networking, Curved Screen Correction, DIGITAL LINK Connection, 4000-Hr Lamp, RGBHV and HDMI inputs. Order lens separately - no lens included. See optional lenses. PT-EX800ZU: 3-LCD, 1024x768 resolution, 7500 Lumens, 5000:1 contrast ratio, H & V lens shift, Wired Networking, 15,000-Hr Filter, DICOM Simulation Mode, RGBHV, DVI-D w/HDCP, HDMI Deep Color, and DisplyPort inputs. See optional lenses. PT-DX800ULK: 1-Chip DLP, 1024x768 resolution, 8000 Lumens, 2500:1 contrast ratio, H & V lens shift, Wired Networking, Dual-Lamp, 12,000-Hr Filter, RGBHV & DVI-D w/HDCP inputs. Charcoal case. Order lens separately - no lens included. See optional lenses. PT-DX810US: 1-Chip DLP, 1024x768 resolution, 8200 Lumens, 2000:1 contrast ratio, H & V lens shift, Wired Networking, Dual-Lamp, 12,000-Hr Filter, RGBHV & HDMI inputs. Silver case. See optional lenses. PT-DX820LBU: 1-chip DLP, 1024x768 resolution, 8200 lumens, 2000:1 contrast ratio, H & V lens shift, wired networking, 12,000-hr filter, RGBHV, DVI-D w/HDCP, and HDMI inputs. Order lens separately - no lens included. See optional lenses. PT-DX820WU: 1-chip DLP, 1024x768 resolution, 8200 lumens, 2000:1 contrast ratio, H & V lens shift, wired networking, 12,000-hr filter, RGBHV, DVI-D w/HDCP, and HDMI inputs. See optional lenses. PT-DX820LWU: 1-chip DLP, 1024x768 resolution, 8200 lumens, 2000:1 contrast ratio, H & V lens shift, wired networking, 12,000-hr filter, RGBHV, DVI-D w/HDCP, and HDMI inputs. See optional lenses. PT-DX100UK: 1-chip DLP, 1024x768 resolution, 10,000 lumens, 10,000:1 contrast ratio, H & V lens shift, wired networking, filter-Less dust-resistant optical engine, RGBHV, DVI-D w/HDCP, and HDMI inputs. See optional lenses. PT-DX100ULK: 1-chip DLP, 1024x768 resolution, 10,000 lumens, 10,000:1 contrast ratio, H & V lens shift, wired networking, filter-Less dust-resistant optical engine, RGBHV, DVI-D w/HDCP, and HDMI inputs. Order lens separately - no lens included. See optional lenses. PT-DX100ULW: 1-chip DLP, 1024x768 resolution, 10,000 lumens, 10,000:1 contrast ratio, H & V lens shift, wired networking, filter-Less dust-resistant optical engine, RGBHV, DVI-D w/HDCP, and HDMI inputs. Order lens separately - no lens included. See optional lenses. PT-DX100UW: 1-chip DLP, 1024x768 resolution, 10,000 lumens, 10,000:1 contrast ratio, H & V lens shift, wired networking, filter-Less dust-resistant optical engine, RGBHV, DVI-D w/HDCP, and HDMI inputs. See optional lenses.